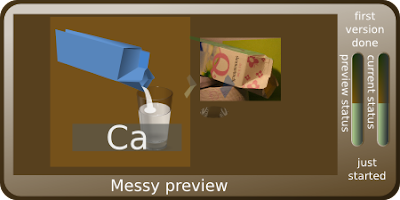 I hope Milk is right for Ca (calcium). I syncing this drawing with the glass for Si (whom share the same glass). The milk container need some anonymous labels or something. And of course the colors here is only for helping me see things better, the final coloring is not started jet. Many of my drawings are done after models witch i lit and photographed (tin-can), some are constructed entirely (micro-oven) and a few is a cross between constructed and inspired by a couple of commercials (prosjector). This one is a cross between to two first. Are you familiar with the single-serving milk cartons? They are much shorter than the one you have now, and I think one like that would fit better in the available space. I remember the shorter milk cartons from schooldays. Maybe I can try out both:-) Thanks. a bit off-topic if i may: i am absolutely impressed with your drawings! especially because they are done with inkscape (which i mistakenly thought was not suitable for real work). please continue and have fun doing it! (Some of the tips may be used at a later stage).